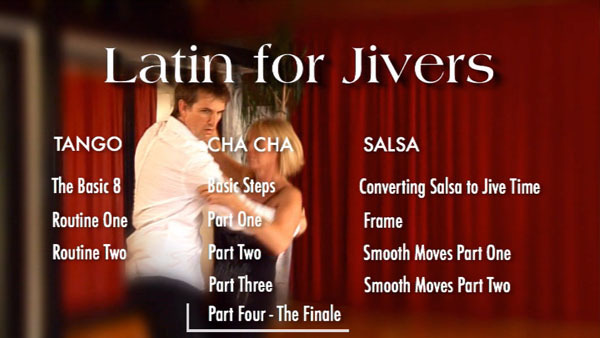 Tango, Cha Cha and Salsa taught to enhance Modern Jive. Ideal for any jive dancer wishing to add that little bit extra to their dancing. You cannot help but impress. This DVD is ideal if you dance Modern/French Jive; you may know it as Ceroc, Mo'jive, LeRoc, SwingRoc or any other jive-related dance or dance company name. This DVD shows you the footwork of the individual dances and explains how to look more like a dancer, concentrating on grip, spinning, centre point of balance and posture, creating a spectacular look. 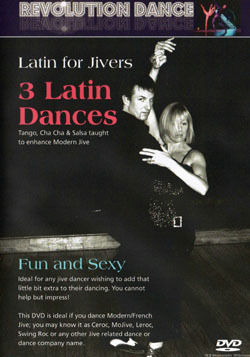 "This DVD is an ideal learning tool for dancers wanting to introduce exciting Latin styles into their dance repertoire. Keith's friendly personality and approach to teaching is a credit to the teaching profession. A great guy who is loved and respected wherever he teaches and performs. Keep up the good work, Keith!" Keith, founder of Revolution Dance, has directed and taught on this DVD with his demonstrator Sue Broady, a specialist in Argentine Tango. Between them they have over 20 years dance experience; Keith has taught Salsa and Cha Cha to Modern Jivers over many years, although his first passion is still jive. Keith has taught, choreographed and performed all over the UK and Europe, also performing cabaret alongside the Philharmonic Orchestra and Katie Melua. He has performed with and taught a host of other stars from theatre and television. The sell out show "Strictly Not Ballroom" was also produced and directed by Keith. His company Revolution Dance now teaches over 1,000 dancers each month. Happy dancing!